The Swazi were one of the tribes who were recoiling from the spread of the Europeans from the Cape Colony ever since the Seventeenth Century. The European expansion would see clashes amongst the nearby African tribes as they struggled to find enough pasture for their cattle and sources of food for their people. A Bantu people, the Swazi were unfortunate enough to come into contact with the expanding Zulu. 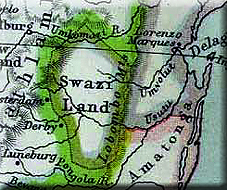 Under the leadership of Mswati II they were able to expand their territory to the Northwest and stabilize the southern frontier with the Zulus. It was from this chief that the Bantu tribe was to get their name 'Swazi' from. Mswati was to initiate the first contacts with the British in an attempt to get some kind of protection from the Zulus. It did not help that the Boer Trekkers had started off another round of realignments amongst their tribes. The Zulus themselves were feeling the pressure from Boers hungry from land and so would clash with the Swazi in turn. The creation of the Boer Republic of Transvaal would see the Swazi squeezed between the Boers to the north and the Zulus to the south. A further strategic concern was the Portugese port of Delagoa Bay to the immediate east of the Swazis. It was one of the finest natural ports in Africa and was eagerly sought after by many European powers although the Portugese were firmly in control. There was a secondary port available to the south of Delagoa Bay at the mouth of the Kosi River. This was in Tongaland to the East of the Swazi, but the Boers were interested in acquiring a port of their own and this was the only one available and Swaziland lay between the port and the republic. Boers would apply enormous pressure on the Swazi to gain access to this port. Bizarrely, Boer representatives were able to supply the Swazi king with plenty of alcohol and get him to sign a document making their President Kruger his heir. Horrified by these developments, the British quickly repudiated the agreement and tried to create a joint administration over the Swazi territory. This was in effect from 1889 to 1893 when the Transvaal Volksraad (parliament) repudiated the agreement. Transvaal was growing increasingly wealthy due to their huge gold deposits and they were feeling more confident. They were also seeking closer diplomatic relations with the Germans at the expense of the British. The British did not not wish to be drawn into a war over Swaziland, especially with the Germans hovering in the wings. The Germans actually sent a fleet to Delagoa Bay in an unsubtle show of force. The British agreed to allow Swaziland to become a protectorate of Transvaal but only with stipulations and provisions safeguarding the rights of the Swazis. The Boers were notoriously racist and treated natives with contempt. 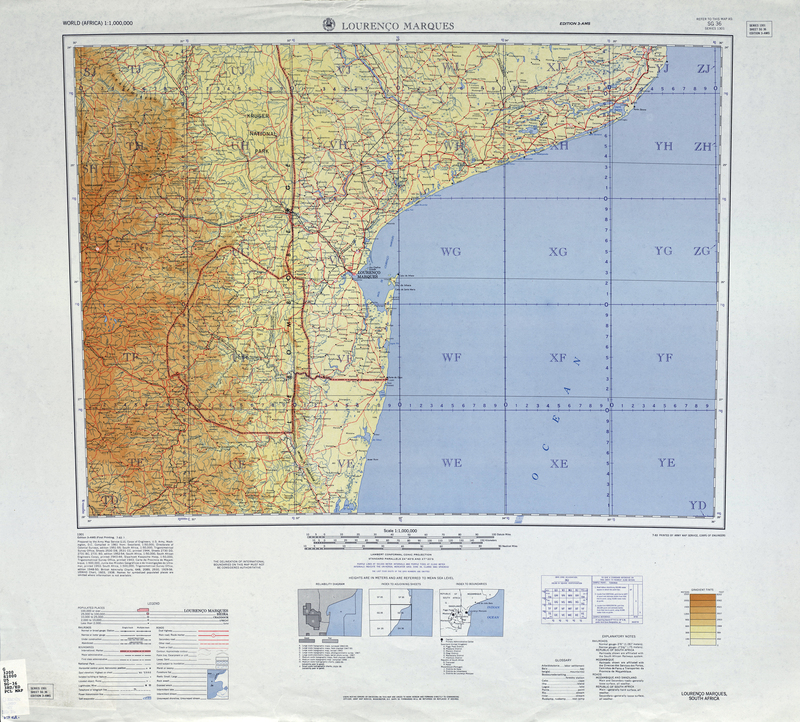 In return, the British claimed control of the area north of the transvaal which would become known as Rhodesia The Boers reluctantly agreed. The British sought to extend some protection to the Swazi population but were also happy to keep some diplomatic avenues open in the region. 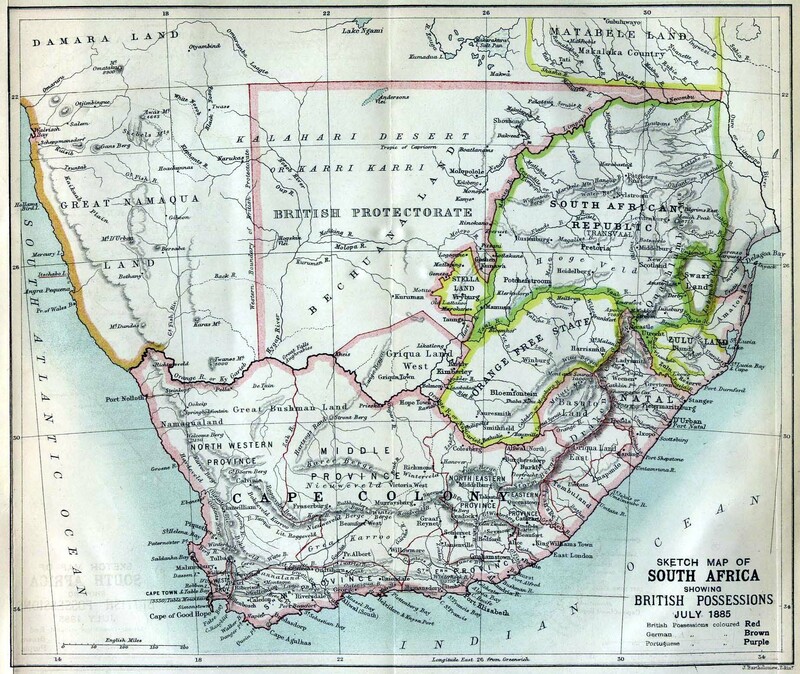 British officials in the Cape and back in London were already seeking ways of incorporating the rich goldfields of Transvaal into the British Empire. It was thought that the Boers would be unable to restrain themselves from poorly treating the Swazi and so provide a pretext for war or annexation of the Transvaal. As events transpired, the Swazi were able to isolate themselves from the Boer War that did break out in 1899. Many Swazi did volunteer to work for the British even if they were prevented from fighting for them. With the destruction of the Transvaal state in 1902, Swaziland passed under full British protection. Given its large population, the white framers of the Union of South Africa did not wish to add such a large black grouping to their new political entity. Swaziland would therefore not join the Union in 1910. This was probably a blessing as the Swazi avoided the worst racist laws of South Africa. However, the Swazi could not isolate themselves fully from the South African regime as other blacks sought refuge in the Swazi lands and markets were opened and closed at the whim of the white regime. Swaziland would gain its independence in 1968.